The International Genetically Engineered Machine competition (iGEM) is the premiere undergraduate Synthetic Biology competition. Student teams are given a kit of biological parts at the beginning of the summer from the Registry of Standard Biological Parts. Working at their own schools over the summer, they use these parts and new parts of their own design to build biological systems and operate them in living cells. This project design and competition format is an exceptionally motivating and effective teaching method. iGEM began in January of 2003 with a month-long course during MIT's Independent Activities Period (IAP). The students designed biological systems to make cells blink. This design course grew to a summer competition with 5 teams in 2004, 13 teams in 2005 - the first year that the competition grew internationally, 32 teams in 2006, and 54 teams in 2007. Projects ranged from banana and wintergreen smelling bacteria, to an arsenic biosensor, to Bactoblood, and buoyant bacteria. This year, eighty-four teams with over 1000 participants from twenty-one countries across Asia, Europe, Latin America, and the US participated in the competition. They specified, designed, built, and tested simple biological systems made from standard, interchangeable biological parts. 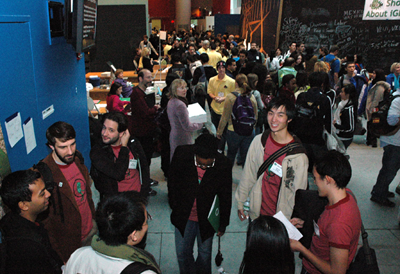 Teams will present their projects at the iGEM Championship Jamboree on November 8-9, 2008. If you're ready to dive into iGEM, make your next stop the iGEM 2008 Main Page. When: Saturday, November 8 & Sunday, November 9. The public is invited to attend the awards ceremony on Sunday beginning at 8am. Where: Saturday in MIT Stata Center & Sunday in Kresge Auditorium. iGEM will challenge you. You will become part of an emerging scientific community that is defining a new cross-disciplinary field called Synthetic Biology. Synthetic Biology is fundamentally about the union of Biology and Engineering. iGEM will introduce you to the fundamental ideas of Synthetic Biology and will give you the opportunity to perform cutting edge research in a field that is continually evolving. Building an iGEM team is not trivial. You will need research space, funding, equipment, and most of all, expertise and leadership. This will require the involved participation of faculty members - someone with the connections to provide for all these needs. If you are serious about building a team for the iGEM competition, start talking to other students and potential team leaders at your school, show this page to them, and send us your information using the form below so we can keep you up to date. As the premiere undergraduate teaching program in Synthetic Biology, iGEM attracts the current and future leaders in the field. The competition format is highly motivating and fosters hands-on, interdisciplinary education. Biology students learn engineering approaches and tools to organize, model, and assemble complex systems, while engineering students are able to immerse themselves in applied molecular biology.